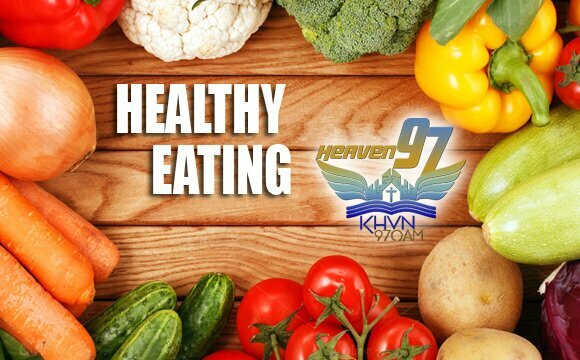 KHVN AM – KHVN wants you to eat healthy! KHVN wants you to eat healthy! Directions1 Whisk whole-wheat flour, all-purpose flour, 2 tablespoons sugar, salt and baking powder in a large bowl. Cut butter into small pieces and quickly rub them into the dry ingredients with your fingers until smaller but still visible. Add oil and toss with a fork to combine. Whisk water and egg yolk in a small bowl. Add to the flour mixture and stir until it begins to come together. Knead the dough with your hands in the bowl a few times until it forms a ball. Divide the dough in half and shape into 5-inch disks. Wrap each in plastic and refrigerate for at least 1 hour. 2 Preheat oven to 400°F. Coat a 9-by-13-inch baking pan with cooking spray and line the bottom and sides with parchment paper. 3 Combine apples, the remaining ¾ cup sugar and cinnamon in a large bowl. 4 Roll one portion of dough between sheets of parchment or wax paper into a 9-by-13-inch rectangle. Peel off the top sheet and invert the dough into the prepared pan. Peel off the remaining paper. Trim the dough so it covers just the bottom of the pan. Spread the apple filling evenly over the dough. Using the parchment or wax paper, roll out the remaining dough, invert it over the filling and trim the edges so it just covers the filling. Whisk the egg white in a bowl until frothy and evenly brush over the top crust. Lightly sprinkle the crust with additional sugar, if desired. 5 Bake until golden brown and bubbling, 40 to 45 minutes. Let cool for at least 1 hour before cutting into 12 squares. Make Ahead Tip: Prepare the crust (Step 1), wrap tightly and refrigerate for up to 2 days or freeze for up to 6 months. Physical activity does not have to be vigorous or done for long periods in order to improve your health. A 2007 study of inactive women found that even a low level of exercise – around 75 minutes per week – improved their fitness levels significantly, when compared to a non-exercising group. Walking is low impact, requires minimal equipment, can be done at any time of day and can be performed at your own pace. You can get out and walk without worrying about the risks associated with some more vigorous forms of exercise. Walking is also a great form of physical activity for people who are overweight, elderly, or who haven’t exercised in a long time. Walking for fun and fitness isn’t limited to strolling by yourself around local neighbourhood streets. There are various clubs, venues and strategies you can use to make walking an enjoyable and social part of your lifestyle. To get the health benefits, try to walk for at least 30 minutes as briskly as you can on most days of the week. ‘Brisk’ means that you can still talk but not sing, and you may be puffing slightly. Moderate activities such as walking pose little health risk but, if you have a medical condition, check with your doctor before starting any new exercise program of physical activity. Take the stairs instead of the lift (for at least part of the way). Get off public transport one stop earlier and walk to work or home. Walk (don’t drive) to the local shops. Walk the dog (or your neighbour’s dog. Try to make walking a routine – for example, try to walk at the same time each day. Remember, you use the same amount of energy, no matter what time of day you walk, so do what is most convenient for you. You may find that asking someone to walk with you will help make it a regular activity. Some people find that keeping an activity diary or log also makes it easier.